At the office, we often have “pie person vs. cake person” debates, but truth be told, I am neither of those things. I am a cheesecake person. It is absolutely my favorite dessert (also, my favorite Ben & Jerry’s flavor, in the form of Strawberry Cheesecake). There’s something about the tangy sweetness of sugar-infused cream cheese along with the high-fat creaminess that really gets me. When I’m craving cheesecake, I want it and I want it now. This immediacy usually means that I’m at the mercy of a neighborhood bakery. When I was a kid, I would make instant cheesecake from a Jell-O mix—possibly with canned strawberry or cherry pie filling on the top, I’m not proud. That was easier than baking it from scratch, but still involved considerable chilling time to get proper cheesecake results. I’m not a completely unreasonable person. I would be willing to wait, say, an entire hour for homemade cheesecake. But who would be the keeper of such an exclusive formula? Fortunately for me, Jennifer Jones—pastry chef at Chicago’s Dos Urban Cantina, which she co-owns with her husband, chef Brian Enyart—was willing to share her family recipe, explaining that there was a whole story behind it. She’s clearly someone who feels as strongly about cheesecake as I do. Jones proceeded to relay the back history of this family favorite, which she sent to me as a photograph of the original, handwritten recipe: “Soon after I was born, my parents were living in Jackson, Mississippi, and they were next-door neighbors to a Belgian woman named Miss Maxwell. She was single; her husband had passed away; and she was just passionate about this cheesecake that she’d made, that was like her pride and joy.” So for Jones’ parents’ wedding, “they asked her as a wedding gift to have the cheesecake recipe. She reluctantly said yes.” If only someone had given me a cheesecake recipe as a wedding gift. Regardless, that is a sweet story. What is so great about this cheesecake? Besides its inherent deliciousness, it also contained my desired speed factor. “It’s just this amazing cheesecake, and can be done in about 50 minutes. Because it’s not super-thick, it doesn’t take that long to bake and it’s delicious, best thing ever. So it should be done within an hour, but it might still be a little warm, which is not a bad thing.” I could barely wait to get started. While making the recipe, I realized its genius: Because the three layers bake individually, you have time to make the next one while the previous one is cooking. Make the crust, and while it’s in the oven, prepare the filling. Pour the filling in the pie crust, then bake it while you’re making the topping. At the end of an hour, I had a delicious cheesecake dotted with blueberries that really wasn’t much more difficult than my old boxed Jell-O mix—but was infinitely better-tasting. Thanks to Jones’ generosity, I now have a new homemade cheesecake recipe for life, which I look forward to dolling up with fruit and/or chocolate chips in future incarnations, rivaling the efforts of even my neighborhood bakery. Thank you, Miss Maxwell. Combine and bake at 400 degrees Fahrenheit in springform pan, pie pan, or individual ramekins for 5 to 10 minutes. Pour into crust and bake at 400 degrees Fahrenheit for 5 to 10 minutes. 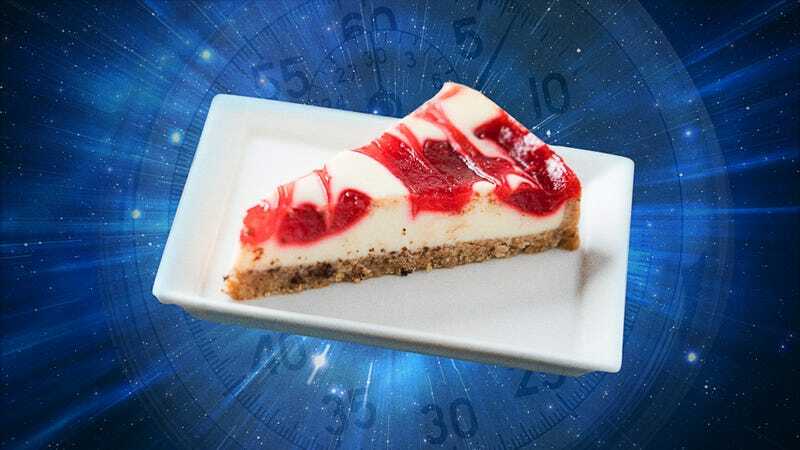 Add topping to cheesecake and bake at 400 degrees Fahrenheit for 10 minutes. Cool and serve with blueberries. can we just start with dessert?